In August 2018, Ireland got direct flight access to China for the first time. With an estimated 1700 passengers coming in from China every week from Beijing and Hong Kong, trade, investment and tourism has just got an awful lot easier. As Brexit bumps along the road towards an uncertain future, Ireland is the only English speaking country within the EU. Ireland has emerged as the third most important destination for Chinese millionaires looking to emigrate overseas, after the US and UK. We have seen a massive spike in our own Immigrant Investor Programme. Last year, of the 329 individuals who applied to secure residency under the scheme, 313 were from China. Our two way trade between China and Ireland is valued at €15 billion, double what it was in 2013! 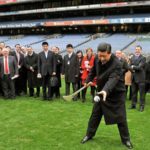 President Xi spent three days visiting Ireland in 2012, while he was still Vice President. To measure the significance of that visit, on the same trip he spent six days in the US and Ireland was the only European country he visited. His visit paved the way to the removal of the ban on beef imports to China and set a solid foundation for Chinese Irish trade. Enterprise Ireland has a very active Access China programme to support investors. The advice: research thoroughly but when you enter, ensure your agile. Working with local partners is essential. Fancy targeting a market that is growing exponentially? Just five years ago, Ireland attracted just 17,000 inward tourists, today we stand at more than 80,000 and by 2025, Failte Ireland forecast numbers to stand at 175,000. For Chinese visitors, think luxury brands, iconic experiences and ‘doing Ireland’ in max three days. To help hotels, shops and attractions to get China-ready, Fáilte Ireland has developed an indepth programme to support leading Irish tourism providers. Let Digital Do the Heavy Lifting! You could be forgiven for thinking Google and Facebook are the digital giants striding the globe. But remember that neither can be used to do business in China. In fact, China has five of the ten largest internet companies in the world, including Tencent, which owns WeChat, and Alibaba, an e-commerce giant, comparable in size to Amazon. The good news is that you can create an online presence in China by using apps such as WeChat. It’s simple to download and leading Irish retailers, such as Brown Thomas, are actively using WeChat to welcome Chinese visitors, create a digital footprint in China and facilitate payment by customers visiting Brown Thomas’ landmark store in Grafton Street, Dublin. A nice coda to our Chinese success story is that Stripe, run by Limerick brothers, Patrick and John Collison, power the online payment system run by Alibaba and other Chinese companies.